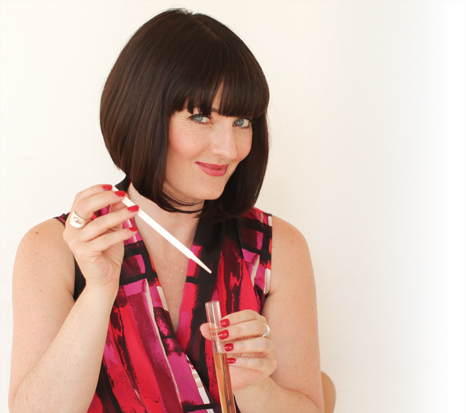 My name is Karen Gilbert and I teach perfumery and coach people who want to start beauty businesses or fragrance lines. I am also the owner of a retail business and tattoo studio which has been running for 10 years now. My business is called Fragrant Alchemy but I currently trade under my own name at KarenGilbert.co.uk as I have 2 books published and that’s what people tend to search for when looking for me online. I started teaching perfumery in 2010 because I’d become bored with my retail business – I am an entrepreneur at heart and a creator. I’ve always been fascinated by fragrance and beauty and learned so much from working in the industry that I decided to pass on my knowledge to others who are just starting out. The people that find their way to me are quite varied, some come to a perfumery class to just have a fabulous day exploring their love of perfume. Others are either already in a business or industry where they need more training or need my assistance to help them grow their fragrance or beauty business. The thing that I love most about working for myself is the freedom it gives me to work from any location in the world – I love travel so having the flexibility to determine my own schedule is really important to me. The surprises have been mainly around what people are inspired by. As a teacher and trainer I was always very focussed on delivering content with lots of information. What I have noticed is that often it is just sharing your experiences honestly and transparently that inspire people the most. The shock for me in starting my perfumery teaching business was just how easy it is when you are doing something you love – it doesn’t have to feel like hard work. Over the last 10 years with two quite different businesses I have grown personally and professionally in ways I really didn’t expect. I have learned that trying to do everything yourself doesn’t save money and can kill your profits, and that when it’s right it’s easy. I am a big believer in being in your own flow and balance with business. Yes you have to roll up your sleeves and do the work but it doesn’t have to be like that forever. Outsource as soon as you can the tasks you hate and are not good at and focus on the things that bring you joy. The thing I’m most looking forward to is a delivering a new coaching package I have for female entrepreneurs who are looking for ways to add value to their already successful brands with a physical product– specifically signature scent. What many people don’t realise is that you don’t need a Beyonce sized budget! Get great results from your own small business, just like Karen. Follow in her footsteps at the Club 100 and learn how to do the work and also how to focus on the things that bring you joy. Find out how it can be both right and easy. Join during August and lock in life membership at £100 per month. New members from 1st September 2014 pay £150 pcm.